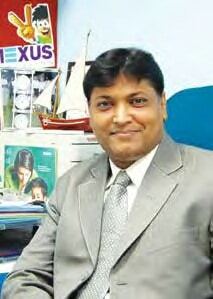 Mexus Education is Indiabased educational innovations enterprise of the Bilakhia Group with presence now extended over 15 countries in South Asia, UAE, and Canada. It is a global venture by the Bilakhia Group. Mexus Education is now serving more than eight lakh students across continents at present and aims to pioneer many more education changing innovations. The company has dedicated team of over 200 professionals, from India’s top institutes like IIT, BITS, NID, top Business Schools, experienced Teachers and child psychologists, involved in research & development in education. Iken Library – World’s simplest Learning Management System with collection of multiple resource formats to instruct every topic of entire K-12 segment.Inbuilt assessment system and report generation. Iken Brain-E-Kids – A futuristic preschool offering theme-based learning to children between age-group of 2-4 years. A complete package for preschool startup. Iken Design & Technology Lab: This is a learning strategy where “learning to think and innovate”is the focus. Iken Store: Withmore than 350+ SKU’s Mexus marks its presence in the retail segment, edutaining curriculum books, D-I-Y toys, audio pen and a whole lot of other products.